Angel Synchronicity – but what can it mean? 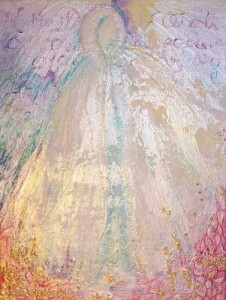 I HAVE a wonderful friend in the delightful Alison Knox, she who channels angel art, messages and divine philosophy. We met many years ago on the UK Mind Body and Spirit circuit and, being artists, nature lovers and generally kindred spirits, formed a firm and lasting friendship. ALISON AND I have each channelled art for each other. 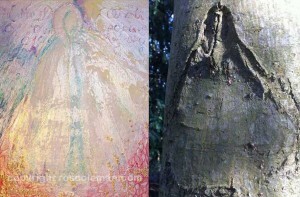 I have by Alison the “Unchained Angel” (see left), a painting I claimed on sight and have cherished ever since. This is the first time my angel has been seen online and I’m not really sure why I am showing it here, but if you’d like to see more angels by Alison you can click the picture and it will take you to her website. THIS ARTICLE is about a painting I channelled for Alison back in 2010 or 11. I REMEMBER feeling acutely conscious at the time I was painting this picture, that I was painting an angel for the very best angel artist I know. It felt like a HUGE responsibility and I felt I just had to get it right, down to the very last detail. THE PICTURE seemed to make no sense at all as it came through. Alison had given me carte blanche as to how I wanted to create it so I chose acrylic with lots of iridescence. The paint went onto the canvas in layers and layers of texture. The texture seemed to be so important at the time even though it did not seem very ‘angelic’. WHEN THE PAINTING was finished I could still make no sense of it. When Alison received it she could make little sense of it either. But she liked the painting, so that was OK. And here it is (right). THE THING about angels is that there is always some kind of synchronicity, meaning, magic. It is always there. But often, the meaning doesn’t become apparent until some time in the future. 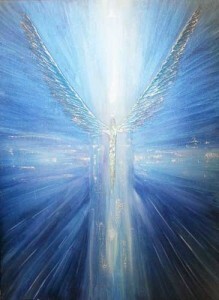 This has happened so often with angel pictures I’ve channelled for others I can’t count. But this is the first time it has ever happened to me. A FEW WEEKS ago Alison posted a picture in Facebook. 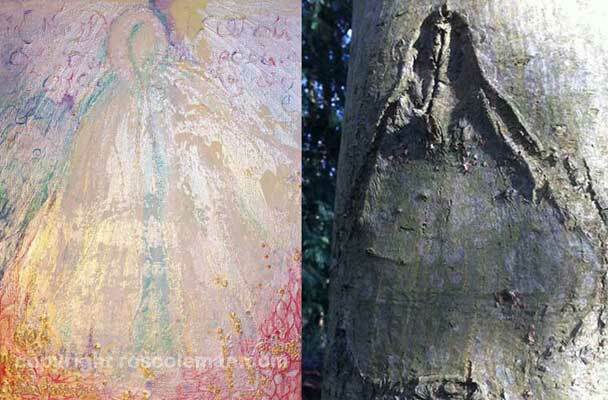 She had been walking in some Nottinghamshire woods close to her home and had seen an image in a tree. ALISON WAS so taken by the image in the tree she took a photo. WHEN I SAW the photo I did a complete double take. Well, I won’t say why but you’ll get the idea. YES, there is considerable, dare I say ‘uncanny’ synchronicity there. I’m searching for a meaning but can’t find one. Of course, the moment I saw Alison’s tree picture on Facebook I contacted her straight away. We ‘oo’d’ and ‘aah’d’ for a little while. I wanted to find a meaning from this extraordinary coincidence – but nothing spectacular seemed to come to light at the time. But as I write and I see these two images side by side, I get a warm feeling in my heart and stomach. And I feel myself smiling that spontaneous smile that lifts and lights one’s entire being from the inside out. And that, I believe, is the meaning. Pure and simple. Because for angels, Love is enough.